Forgive us, O God, our feeble faith. Those words ring in my head with the same monotonous tone of a congregation of people reciting the Lord’s Prayer. It echoes through the cavernous ceilings and stained glass windows of my mind. Because my faith is too small, my doubts are too big, and I’m a little too clumsy to walk the straight and narrow. I was reading the story of the widow at Zarephath. Growing up in Sunday School, it’s a story I heard a hundred times. I’ve seen it play out before my very eyes at more than one VBS. It’s a miracle story. A woman who is prepared to die of starvation encounters a prophet who assures her that she and her son will not go hungry. That God will provide for her during the drought that destroyed her land. Excuse me, Widow Lady, but did you just figure that out? Did God not prove Himself to you in all that time you survived on the same drop of oil and handful of flour? I mean, come on! So I stop to consider how this came to be, and I wonder if the widow simply began to see first miracle as ordinary—something to take for granted. Because of course the oil wouldn’t run out. Of course there would always be flour to spare. There always was. I wonder if the widow started to trust in the miracle more than in the God who made it possible. And I realize I can’t judge her for her response. Because how many times have I done the same thing? 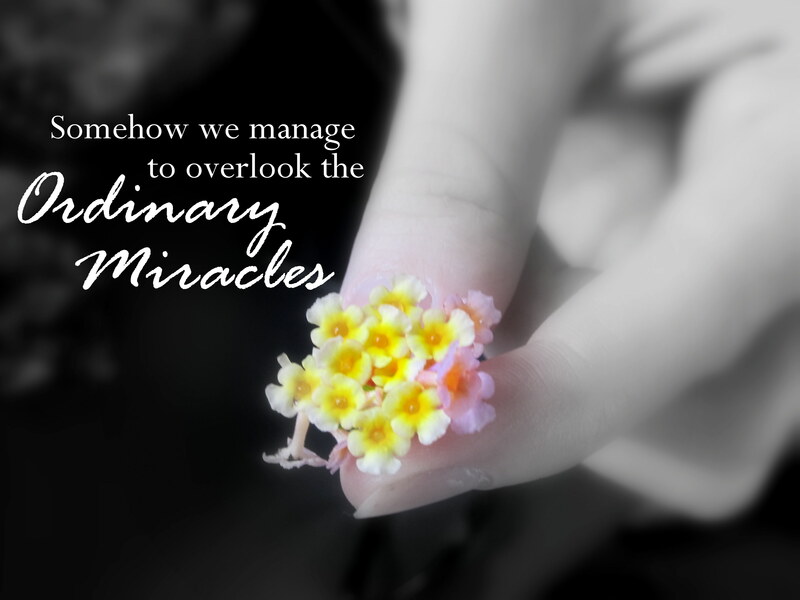 How many times have I overlooked the small miracles in my life, rationalizing them away until I accept them as ordinary? We are a people of feeble faith, begging for a sign when our very lives are a testimony of God’s faithfulness. Stop and dust your life for God’s fingerprints because, darling, I’m willing to bet they are all over you. It’s hard to see in the moment. I know it’s so hard to see in the moment what is real and what is fake and what the purpose of everything is. But take a moment to breathe, sweetheart—just breathe—and look at how far God has brought you. Look at how He has led you all along. You’ve been waiting for a miracle, but, darling, you are one. Yes, your very life is a bigger miracle than you will ever know. I love how God knows exactly what we need, and reveals it to us… over and over again. Glad I could help spread His message!